ASSrenamer renames CinemaDNG sequence files from “FRM_000001.DNG” to more practical names like “SHOGUN_S001_S001_T001_FRM_000001.DNG”. Don’t forget to create a login to get FREE UPDATES! 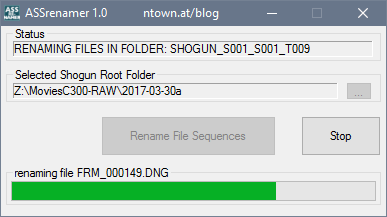 ASSrenamer is a file sequence renamer for Atomos Shogun external recorders which generates CinemaDNG sequences with file names like FRM_000001.DNG and batch-renames the squences automatically to more practical names like SHOGUN_S001_S001_T001_FRM_000001.DNG including the parent folder scene and take name. ASSrenamer is made for Windows (7/10), but also works on Mac via Winebottler. Please read NTown’s article about the latest Atomos Shogun CinemaDNG update and learn why ASSrenamer exists.